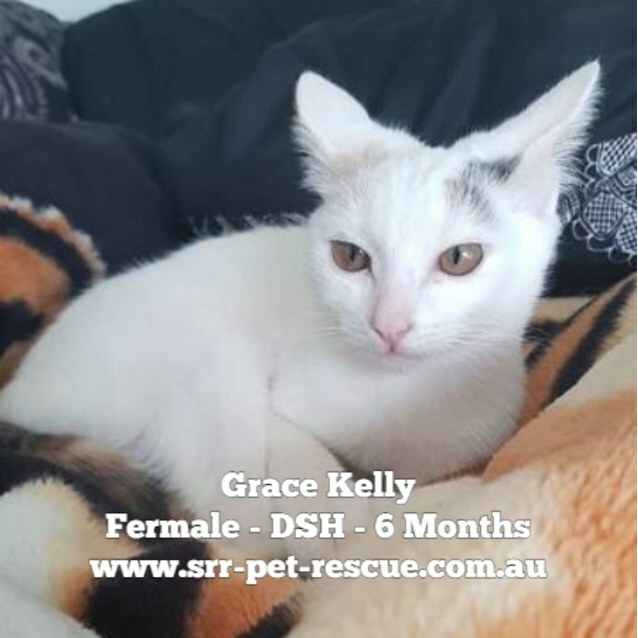 Hi I am Grace Kelly – or Gracie if you like. I am a mostly white DSH with a crazy multi-coloured tail, and other little patches of colour scattered over my pale coat. I am just the sweetest little miss. I’m a very confident and friendly girl, that likes nothing more than curling up on your lap and purring away. I love playing with yarn and little toys, licking and grooming everyone around me – myself, other cats, dogs and sometimes even people – whoever is closest, I’m not picky. I settled in very quickly to my foster home, so would be a very comfortable and quick fit to your loving family. I have loads of love to give, please consider me for your family, I am happy with dogs, other cats, and children. Grace Kelly will make the perfect addition to your family. to find out more please contact Tiffany on 0432 580 459 or find us on facebook "Soquilichi Rescue Ranch"